This is a sponsored post for Kikkoman, but all opinions are my own. From the 17th century to your 7 p.m. dinner, Kikkoman Soy Sauce has endured the test of time and taste. 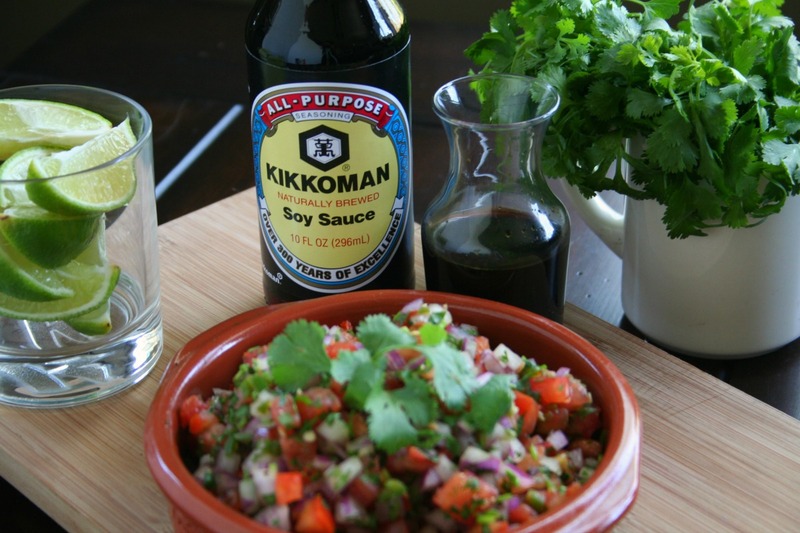 With Japanese roots, Kikkoman Soy Sauce weaves its way comfortably in many cuisines and has found a home in our Latino kitchen. This naturally brewed flavor enhancer is versatile enough to be used in your carne asada marinades and your salsas, but it can also be used to amplify your drinks and even enrich your desserts in ways you may not have thought of. The company was started by a woman at a time when it simply was not done. After 19 generations, Kikkoman is still guided by a family creed and governed by a family philosophy, Isogaba maware, which translates into “make haste slowly,” which means to advance and grow, but to do so with tremendous thought and care. That thought and care leads to a six month natural brewing process that yields Kikkoman’s signature flavor. With all the depth and weight of such a profound history, it is hard not to make comparisons to a certain Veuve and her Champagne dynasty. With such a versatile ingredient, it is no wonder that professional chefs, restaurants and home cooks rely on Kikkoman’s Soy Sauce to flavor their perfectly seasoned dishes. It is true in our home, too, along with marinating our carne asada, we use Kikkoman Soy Sauce to grill vegetables, sear fish, make sauces, flavor micheladas, whisk together vinaigrettes, and season our beans. We are excited to be able to partner with Kikkoman because as their sauces flavor our dishes, they also help to flavor our lives. The recipe that follows is very sentimental to me. 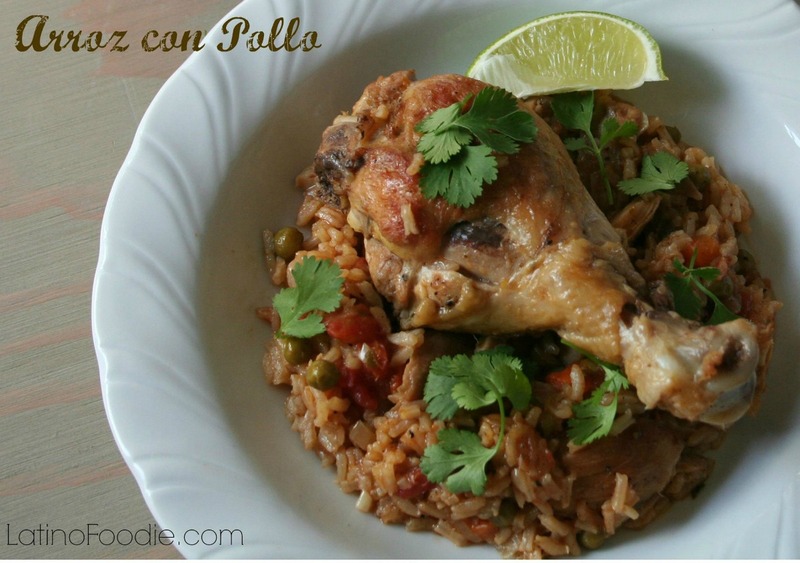 When I started cooking, Arroz con Pollo was one of the first dishes I made. Of course back then my timing was always off and my seasoning was always late to the party. 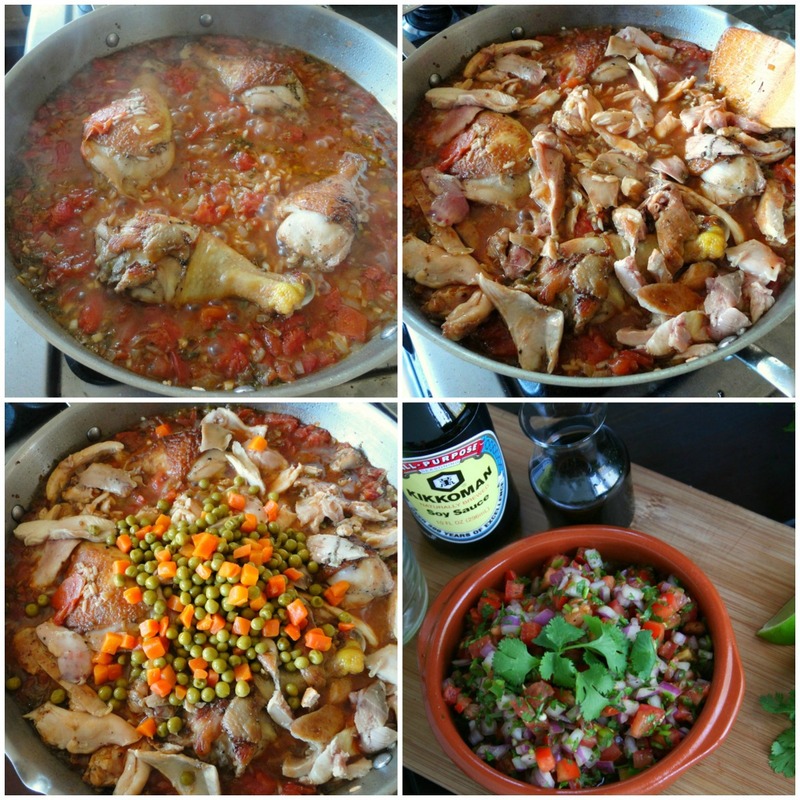 Now, when I make this dish, I think about that first time I made this and overcooked the chicken until it was like eating masticated caña bark. But with a smile, my friends dutifully choked it down. Now when I make this dish with Stephen, we always have the debate of shredded chicken vs. leaving the bones in some of the chicken pieces, such as the thighs. We’ve decided that either way the dish is tasty and comforting, so we can both be right! Marinating and searing the chicken with Kikkoman soy sauce is the most impactful way to flavor the chicken for this dish. Whether or not you decide to shred the chicken is entirely up to you. I’ve also included a recipe for a fresh pico de gallo, or “Kikko de Gallo,” also made with Kikkoman Soy Sauce. To can find Kikkoman on the web on Facebook, Twitter, Instagram and Pinterest. 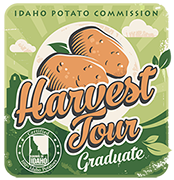 Each of their social media platforms are filled with great recipes and ideas for your next meal. So root through your pantry and get cooking! 1. Remove the chicken skin (optional) and trim excess fat. Place the chicken, soy sauce and pepper in a large gallon sized freezer bag. Toss to evenly coat and allow to marinate for at least 30 minutes, refrigerated. 2. Heat 1 tablespoon oil in a large skillet over medium heat. Working in batches, place the chicken in the hot oiled pan for about 5 minutes each side. The chicken will get a nice sear and get partially cooked. Place on paper towel to drain. 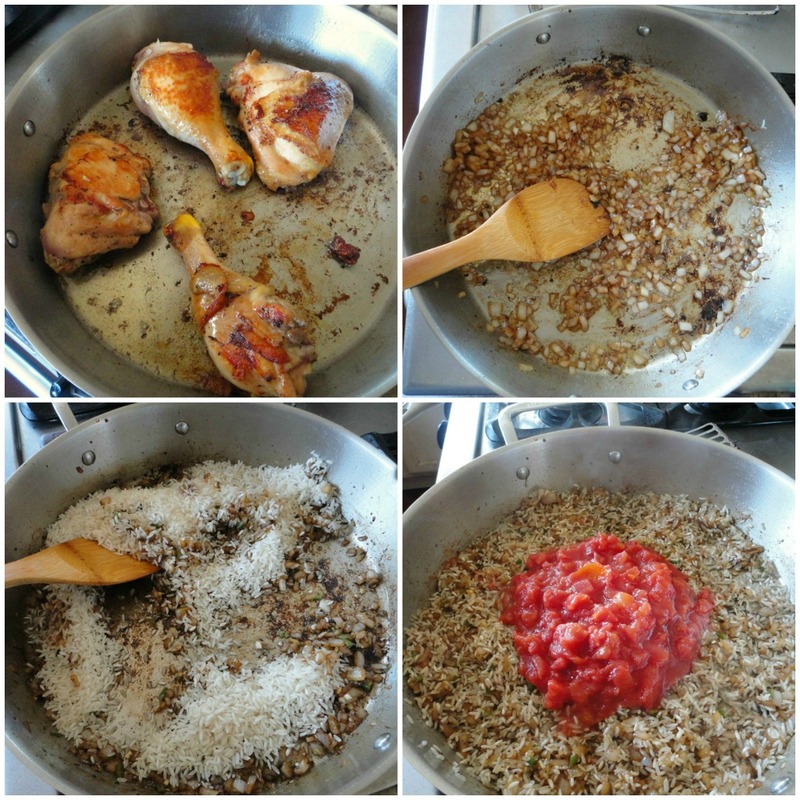 You can add more or less oil depending on the fat content and whether or not you skinned the chicken. 3. Your pan should have enough oil, but you can remove any excess oil. Add the onions and allow to cook for 3 minutes, or until they become translucent, about 3 minutes, scraping the bottom of the pan as you go. 5. Stir in the diced tomatoes and juice, allow to cook for 1 minute. 6. Add the broth and bring to a boil over high heat. Add the chicken pieces, reduce to a simmer, cover and cook until the rice and chicken is cooked through, about 15 minutes. Allow to stand with the lid on for 5-10 minutes. 1.Combine all the ingredients in a large mixing bowl. Refrigerate for at least 15-20 minutes before serving. Super rico! So delicious! What a great way to use soy sauce!